In terms of expense ratio. When it comes to selecting what mutual funds to buy, one of the important factors to consider is how much they will cost you to own the funds. When buying stocks, I would generally want to go with the broker that charges less commission for each trade. The reason is pretty simple. If I have $100 to invest, the less commission I pay, the more I can actually use to buy shares. The same is also true for mutual funds, even though it’s not that obvious on the surface. For example, if I have $100 and want to use that money to buy, say, Vanguard S&P 500 Index Fund (VFINX) from Vanguard. At today’s closing price of $126.07, the $100 I have buys me 0.787 ($100/$126.07 = 0.787) shares. It doesn’t seem to cost me anything at the time when I purchased the share, but I will still pay for my investments. For mutual fund investment, since every fund is different, there are usually more to take into consideration when making selections, including performance, asset allocation, risk, manager tenure, and, of course, costs. Mutual fund fees are more subtle than the trading commission for buying stocks because you don’t usually pay the fees upfront as you would do when trading stocks, unless it’s a fund with a front load. Rather, mutual fund fee, appearing as expense ratio (ER) in a mutual fund’s prospectus, is an operating expense that is used to cover the cost to operate the fund, just like the cost to operate any other business. For actively managed funds, a large portion of the fund’s total cost is paid to fund managers to research on what stocks to be included in the fund’s portfolio. The expense ratio is calculated on a yearly basis against the total assets under the fund and given a percentage value. Unlike the costs in trading stocks, which occur at the time of a transaction, such as buying and selling shares, mutual fund operating expense, also call management fee, is ongoing as long as you own the fund and they are taken out directly from the fund’s assets every year. What it means to fund investors is that it will reduce the return of the fund because the return is calculated after subtracting operating expense from the fund’s total asset value. Since the fund’s asset comes from contributions from every fund investor, if you are investing in a mutual fund, then you are paying for the management fee. While you can’t avoid paying the fee when investing in mutual funds, the good news is that over the long term, mutual funds are getting cheaper as the expense ratios are coming down steadily. 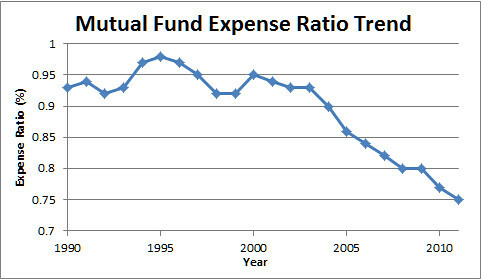 According to a Morningstar article yesterday, the average expense ratio an investor paid in 2011 was 0.75%. That’s nearly 20 basis points lower than the average ER 20 years ago. As explained above, a lower fee means a better return for investors. Even though mutual fund companies have cut fees over the years, it is us investors and the decisions we made on where to put our money that had “the greatest impact” on the mutual fund fees as more and more opted to buy funds with lower costs then their peers. Now that you know what the average ER is for a mutual fund, you need to check the expense ratios of the funds you are considering to buy to see if they are too expensive (International funds generally have higher ERs than domestic funds and bond funds often have lower ERs than stock funds). Even for those funds you already own, maybe it’s a good idea to see whether there are cheaper alternatives out there.